Are people in general dominated by unreason? Are there effective ways to influence changes in behaviour, for good, despite the irrationality and other obstacles to change? Estimates of probability were low for both statements, but significantly lower for the first group (1%) than the second (4%). People are bad at analyzing what is really a risk, particularly for things that are more long-term or not as immediately frightening, like stomach cancer versus homicide; people think the latter is a much bigger killer than it is. 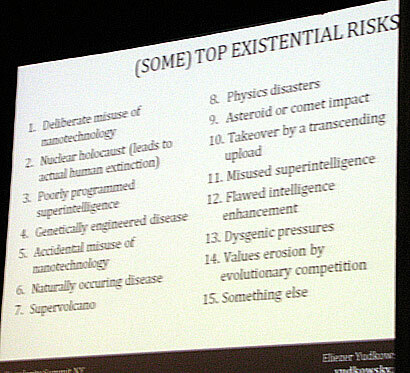 This is particularly important with the risk of extinction, because it’s subject to all sorts of logical fallacies: the conjunction fallacy; scope insensitivity (it’s hard for us to fathom scale); availability (no one remembers an extinction event); imaginability (it’s hard for us to imagine future technology); and conformity (such as the bystander effect, where people are less likely to render help in a crowd). Yudkowsky concludes by asking, why are we as a nation spending millions on football when we’re spending so little on all different sorts of existential threats? We are, he concludes, crazy. It was a pessimistic presentation. It was followed by a panel discussion featuring Eliezer, life extension researcher Aubrey de Grey, entrepreneur and venture capitalist Peter Thiel, and Singularity Institute president Michael Vassar. One sub-current of the discussion was: given how irrational people tend to be as a whole, how can we get the public to pay attention to the important themes being addressed at this event? 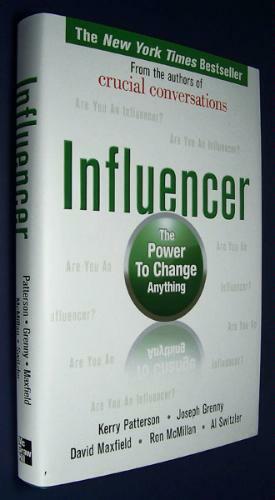 For a much more constructive approach, I recommend the ideas in the very fine book I’ve just finished reading: Influencer: the power to change anything. No less than five people are named as co-authors: Kerry Patterson, Joseph Grenny, David Maxfield, Ron McMillan, and Al Switzler. It’s a grand collaborative effort. Companies spend more than $300 billion annually for training and less than 10 percent of what people are taught sticks. Dieters spend $40 billion a year and 19 out of 20 lose nothing but their money. Two out of three criminals are rearrested within three years. If influence is the capacity to help ourselves and others change behavior, then we all want influence, but few know how to get it. Use personal and vicarious experience to change thoughts and actions. Marshall multiple sources of influence to make change inevitable. As I worked through chapter after chapter, I kept thinking “Aha…” to myself. The material is backed up by extensive academic research by change specialists such as Albert Bandura and Brian Wansink. There are also numerous references to successful real-life influence programs, such as the eradication of guinea worm diseasee in sub-saharan Africa, controlling AIDS in Thailand, and the work of Mimi Silbert of Delancy Street with “substance abusers, ex-convicts, homeless and others who have hit bottom”. What we lack, the book says, is the skillset to be able to change more things. It’s not a matter of exhorting people to “try harder”. Nor is a matter that we need to become better in talking to people, to convince them of the need to change. Instead, we need a better framework for how influence can be successful. Part of the framework is to take the time to learn about the “handful of high-leverage behaviors” that, if changed, would have the biggest impact. This is a matter of focusing – leaving out many possibilities in order to target behaviours with the greatest leverage. Another part of the framework initially seems the opposite: it recommends that we prepare to use a large array of different influence methods (all with the same intended result). These influence methods start by recognising the realities of human reasoning, and works with these realities, rather than seeking to drastically re-write them. The framework describes six sources of influence, in a 2×3 matrix. One set of three sources addresses motivation, and the other set of three addresses capability. In each case, there are personal, social, and structural approaches (hence the 2×3). The book has a separate chapter for each of these six sources. Each chapter is full of good material. Structural ability: change the environment: harness the invisible and pervasive power of environment to support new behaviour. Rather than bemoaning the fact that making a story more specific messes up people’s abilities to calculate probabilities rationally, the book has several examples of how stories (especially soap operas broadcast in the third world) can have very powerful influence effects, in changing social behaviours for the better. Listeners are able to personally identify with the characters in the stories, with good outcomes. However, the analysis of this curve in “Influencer” focused instead on the difference between “Innovators” and “Early adopters”. The innovators may be the first to adopt a new technology – whether it be a new type of seed (as studied by Everett Rogers), a new hi-tech product (as studied by Geoffrey Moore), or an understanding of the importance of the Singularity. However, they are bad references as far as the remainder of the population are concerned. They probably are perceived as dressing strangely, holding strange beliefs and customs, and generally not being “one of us”. If they adopt something, it doesn’t increase the probability of anyone in the majority of the population being impressed. If anything, they’re likely to be un-impressed as a result. It’s only when people who are seen as more representative of the mainstream adopt a product, that this fact becomes influential to the wider population. As Singularity enthusiasts reflect on how to gain wider influence over public discussion, they would do well to take to heart the lessons of “Influencer: the power to change anything”. Made to Stick: Why Some Ideas Survive and Others Die, by brothers Chip and Dan Heath. Kluge: The Haphazard Construction of the Human Mind, by Gary Marcus (which I reviewed here). Interesting. This sense of helplessness has been a factor in my life. I think it can be effective to help provide solutions to problems that most people aren’t yet feeling. Those negative-future-uncertain things eventually start to affect the majority. At that point we’d like something useful to be ready, so that the outcome is not more stupidity. For that to happen, it isn’t necessary to influence the majority – just enough of the innovators and early adopters to maintain a critical mass to support research and development until the crisis point. However, with greenhouse gas emissions and perhaps in other areas, the crisis may be already upon us but it isn’t hurting people enough to act on the scale required. Thus the solutions we have to develop become increasingly dramatic. We’re relying on humans being able to rise to the challenges when they do become evident. Does the book have any insights into how to approach the negative future uncertain problems? The kind of vivid stories told by Al Gore, Elizabeth Kolbert and others, have the power to rouse people’s interest, because they often describe the experiences of individuals (humans and animals) who are already being impacted by changing climate. It’s necessary to identify a small number of behavioural changes which people can research for themselves, and understand how they will lead to the effects that are desired. This requires input from domain experts – eg dietary experts in the case of which behaviours to change to lose weight, disease control experts in the case of how to eradicate the guinea worm disease, and climate change experts in the case of avoiding climate change catastrophe. However, whilst we have plenty of (1. ), we don’t have (2. ): there’s nothing like sufficient consensus among experts as to “a handful of high-leverage behaviors that lead to rapid and profound change” as regards the impact of humans on the planet’s climate. And the book makes plain that having (1.) without (2.) can often be counterproductive. Footnote It’s possible to ask questions, such as yours, on the website accompanying the book. A personal opinion — I think Moore’s chasm analysis applies much more to enterprise product adoption than it does to consumer products (or to public issues such as social and environmental change). The chasm is driven by the fact that companies tend to polarize fairly strongly into early and late adopters of technology, without so many in the middle. I think the gap between these two groups is the chasm Moore identified. In my experience, consumers do indeed operate the way that you described, David, with the most important gap being between the innovators and the early adopters. The people labeled “innovators” are not effective at driving a new innovation into the populace; they tend to hoard new ideas because it makes them feel special and different from everyone else. If you want to see this attitude in action, check out the dismissive way that some technophiles online speak about the rest of the populace. A bigger problem with applying the adoption curve to influencing on social issues is that the adoption curve is based only on beneficial innovations — things that the average person will see as useful and rewarding once they try them. The early adopter says “this is cool, give it a try,” the later adopters follow, and everyone ends up happier. Understanding the Singularity doesn’t give a person any immediate tangible benefits. There’s no innovation here to adopt, just a mental paradigm to work with. So I’m not convinced that the adoption curve is even applicable in this case.